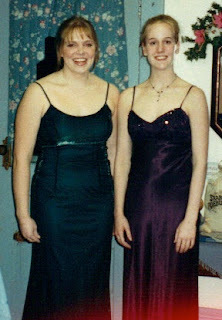 My dear and long time friend, Jessica Stank, is guest blogging this post. As Jessie mentions below, we have been friends for a very, very long time. 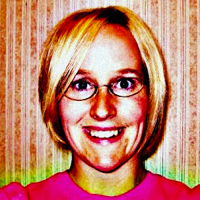 She is extremely creative in both homemaking and writing. In addition, she is the most resourceful person I know. I asked her to write on a subject that I have absolutely no experience in: raising chickens. We have talked about her chicken adventures over the years, and I have always been intrigued. I would love to raise chickens, but I think my neighbors (and husband) would have issues with that. Perhaps someday...until then, I will live vicariously through Jessie! Jessie has also written two young-adult superhero e-books, which can be purchased on Amazon. They are wonderful! Check them out! My name is Jessie and I have been a long time BFF of Leslie’s. We’re talking since the sixth grade! I am a writer and blogger, among other things, and it is my pleasure to be a guest blogger on “Things My Mother Taught Me.” I will do my best to do it justice. I normally write sci-fi stuff, but today I am channeling my inner domestic-goddess. I am happy to bring you a post about one of my hobbies: raising chickens. I hope you enjoy it! What is cuter than a fuzzy yellow chick? At our house, it is one of the signs of spring. It is a tradition that sometime in March a cardboard box full of peeping chicks and wood shavings sit in the corner of the kitchen. I love my chickens. My birds are free range, and they wander around the yard, pecking at things and being all cute. I love it. I’ve been raising birds for about five years, and I will keep right on doing it until I am no longer physically able. Chickens are great for so many reasons. Perhaps you have been into a farm store in the spring and you’ve seen those oval water tanks full of chicks and baby ducks. Perhaps you’ve entertained the idea of bringing some of those little guys home with you. And, why not? Baby chicks are totally adorable and grown chickens provide you with eggs and meat. Besides, they are just plain fun to watch, pecking and scratching around the yard. So, you want to raise chickens. As farm animals go, chickens are by far the easiest and most low maintenance option. They don’t require a ton of space, don’t need to be groomed, and don't require a big startup cost, relatively speaking. The only things you need when bringing home baby chicks are: a big box, bedding material, a heat lamp, chick feed, a plastic or metal feeder to hold their food, and a little drinker for their water. All of these items can be purchased in the same place you buy the chicks. Day old chicks generally only cost a dollar or two a piece. It is best to buy more than you expect to keep as it is rare that all of them survive to adulthood. What’s with the heat lamp? Baby chicks cannot control their body temperature until their adult feathers come in. They like to be kept right around 90 degrees. If they get too cold, their little bodies shut down and they die. They need a heat lamp available so that they can stand under it when they need to warm up. If you live in a cold climate area like I do, then you will want to keep the chicks inside until it stops freezing at night. If you live in a warmer climate, feel free to keep that box of peeping babies out in the garage or barn. Make sure food and clean water are available to them at all times. You will want to change that bedding frequently too, as chicks can be a little messy. If you buy your chicks as straight run, you will not know the gender of the chicks until they begin to grow. The easiest way to tell which ones are roosters is to watch the growth of the red comb on the top of their heads. 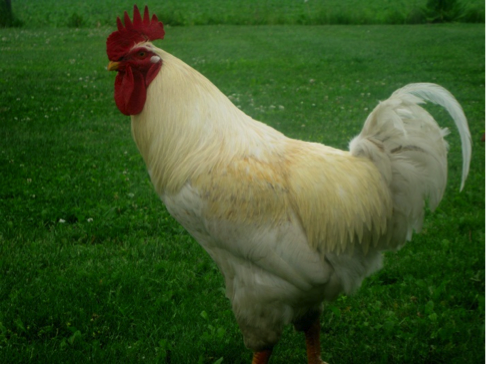 Roosters have large combs; they are much larger than a hen’s comb. Roosters also sprout very long tail feathers, whereas hens’ tail feathers are short. Crowing is also a dead giveaway. Buying straight run is cheaper, but it is a total crap shoot. If you don’t want a rooster, I would avoid the straight run. If you buy pullets, it means you will have hens only. Pullets cost a bit more, but you know what you’re getting. You will quickly discover that baby chicks aren’t cute for very long. It only takes a couple of weeks for them to get awkward looking and start to sprout real feathers. You will begin to get a sense of what they will look like as their feathers start to come in. Once their little bodies are covered in real feathers and all of that baby fuzz is gone, you can discontinue use of the heat lamp. When you are ready to move those noisy little birds outside, you will need a shelter of some sort for them. You can build a coop or buy one readymade. Chickens aren’t picky; they just want to be inside at night and want to roost while they sleep. Your coop doesn’t have to be anything special. My very first chicken coop was made from an old ice fishing shanty. Be creative! Your hens will want nesting boxes. These can be as simple as old milk crates or five gallon pails. You can go all out and build fancy nesting boxes if you’re crafty. Or, you can do what I did and have your grandpa build them for you! You will need a box for every 4-5 hens. Your chickens will be fully grown in four months, and you will start to see small eggs at around six months of age. Yay for eggs! 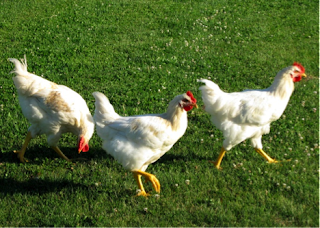 If you have close neighbors, you may not want to let your chickens run loose. Some neighbors are not understanding of free range chickens roaming around. If this is true for you, fencing in an area for them is a good idea. Make the fence pretty tall, because even though chickens can’t fly, they can take off and land. Chickens are also very disrespectful of vegetable gardens. Keep that in mind! Don’t I need a rooster if I want eggs? Oddly enough, you don’t. Do you see that guy up there? His name was Dave. He was a magnificent looking rooster and took his job very seriously. We ended up eating him for dinner because he was uber-aggressive, and he kept attacking the children. You do not need a rooster to get fresh eggs. You only need a rooster if you want more chicks. Hens will lay eggs regardless of whether or not they have been fertilized. The eggs you buy from the store are not fertilized. There are some positive things about having a rooster. Roosters protect their hens from predators. They are very pretty. They also taste good. If you bought straight run and ended up with too many roosters, (you really only need one), you can butcher the rest and put them in the freezer for Sunday dinner. There are also negatives aspects to having a rooster. There’s the crowing. The five in the morning on Saturday when your bedroom window is open in late spring wake up call. The crowing is loud! Those neighbors I mentioned earlier might not appreciate the crowing. Roosters can be jerks. Some are very protective and will tear into you every chance they get. Not all of them are like that, but some are over the top (like Dave). I like to keep one rooster to be on guard. We tend to have trouble with predators in our area. Once you get started, chickens are super easy. They are great for teaching kids responsibility. Fresh eggs are a healthy choice because you know exactly what the chickens’ diet is. The same is true of the meat. There are certain breeds that are considered meat birds and others that are egg layers. You can find a few dual-purpose birds too, if you are looking for both meat and eggs. There are certain breeds that can tolerate hot temperatures or cold temperatures better than others. It is best to do some research beforehand so that you know what birds will work best for you and where you live. If you are interested in a little hobby farming, I would recommend chickens as the place to start. Raising chickens is super easy and very rewarding. It’s okay to start small. Begin with four or five chicks and then go from there if you find it is something you enjoy.